There’s been a lot of discussion lately about ride-sharing services like Uber and Lyft (and there’s even discussion on whether these services fit the definition of ride sharing). I’ve been relatively silent on the podcast about this but I stomp around the house having very strong opinions on them. In Los Angeles, taxi cabs are super creepy. The drivers drive dangerously and the cars are horrible. They’re smelly with hard bench seats and a big wall right in front of your knees to separate you from the driver. Figuring out when they are going to show up is a nightmare too. We’ve had them not show up and we missed our flight to Hawaii! For the most part, the cab drivers have been highly unpleasant to us as well. I had a woman yell at me because I wanted her to close her window because I was cold. We had a woman show up with the entire trunk filled with laundry so she pulled all of it out, threw it on our driveway, put in our luggage and then dumped her laundry on top…and reversed this process when we got to the airport. We had one guy drive us home from the airport so dangerously that Steve pursued the arduous path of reporting him to the Taxi association. I’m not speaking for all cities, but in Los Angeles, I cringe at the thought of taking a taxi, and only ever used it to go to and from the airport because the other options were even worse. Steve and I like to enjoy wine while we’re out to dinner, and before Uber, we never once called a cab so we could drink. Instead, one person got to enjoy the wine while the other had to be the designated driver. It was sad for the DD, and we would try to cajole each other into taking our turn. Never once did it occur to us to call a cab. I’ve asked my friends and none of them have ever called a cab in Los Angeles so they could drink in the evening. You’ll notice that the one thing I haven’t complained about is the price. The price seemed fair to me at around $25 to get to the airport which isn’t bad for two people. It was absolutely everything else about the experience that I dreaded. And then came Uber. I open the Uber app on my phone around a half hour before I want to leave and get an idea of how close the drivers are. That lets me know how far in advance I need to call one. I tap on the slider to choose an UberX (the least expensive option) and if I put in a location I can see the cost of my fare. In a few seconds I get a notification that my driver is on the way. The app shows me the driver’s name, the driver’s license plate, and color and type of car. I can see on a map where the driver is, and track their location so I know when to be ready for them. I can even call them on the phone, which is necessary sometimes in busy areas where you’re trying to connect on a street corner. Now here’s where it gets even more wonderful. Every single Uber car we’ve been in has been clean and doesn’t smell weird! I think because these cars are owned by the drivers, they take pride in their vehicles. Or maybe it’s a requirement of Uber? The cars are all relatively new, and even though I always choose the UberX option, they’re very nice cars with comfortable seats. Steve and I have made a habit of always talking to our Uber drivers, asking them how long they’ve been driving and what they think of it. I think we’ve had one or two who are disgruntled but the rest tell us tales of interesting people they meet, and of the intricacies of how Uber works. Oddly it’s very rare to find someone who has been driving for more than 6 months or a year for Uber, which might be telling. We met one guy who told us he quit his taxi job to drive Uber and how much more he likes it now. He said he was required to work 12 hour shifts, and now he can work when he wants to and when he can and he’s making just as much money. We met a guy who bought a nice car with his dad and they take turns being Uber drivers in it. They make a killing on weekends when he drives the bar scene and his dad makes good money driving it during the day. When you’re done with the trip, the driver ends the transaction and you get to rate the driver. Remember I told you how arduous the process was for Steve to complain about the dangerous taxi driver? You get 1-5 stars for an Uber driver, and if they get more than a very few 4-star or lower ratings they’re out. One fellow told us that a rating of below 4.7 gets you kicked out. I know you won’t believe me if I tell you only stories of rainbows and sunshine with Uber, so I should mention a few bad experiences. We had one guy in San Francisco who was losing his ever loving mind because there was traffic. What did he expect in San Francisco? I kept trying to calm him down, telling him we weren’t in any hurry, it was only a party we were going to, but he kept yelling and screaming out the window at everyone and made us VERY nervous. You can bet he got a 1 star review. We also had a guy who picked us up late and didn’t have enough gas to get us to the destination. I was really sad because it made us late to a surprise dinner for Lindsay and she figured it out because we walked in so late. However, the guy didn’t charge us for the time from when he stopped at a gas station until we got to the restaurant, saving us around $25 and then I felt bad for the guy. We took taxis in Las Vegas for the first day or so of CES, and then Dave Hamilton suggested we try taking Uber since they had just gotten permitted to work there. We waltzed past 45 minute long lines for taxis and had Uber drivers pull up in just minutes. 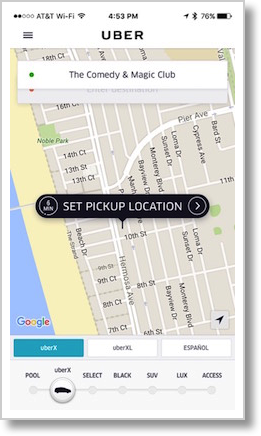 Since this is a hot topic with taxi drivers, they have you pick up Uber at a different location at the hotels. This was the first time I noticed the price, because I had a frame of reference. While a taxi drive of 10 -15 min to move between Vegas Strip hotels would cost us around $15 plus tip, it was only $8 in the Uber, and no tip is required and not even an option in the app. I know you can give a cash tip but that’s a longer discussion. Since we were traveling geeks with Dave, Chuck Joiner and Don McAllister, we started learning more about the app. Like did you know you can split fares with the Uber app? Don figured this out and it worked as long as you had the other person’s phone number in your contacts. If Don paid the bill and split with us, it worked, but we wren’t able to get a split working from our accounts to Don’s international account. And yes, we suggested that Don did something to cause that. Anyway, yet another cool feature of Uber. You haven’t heard me mention Lyft very much and there’s a reason for it. We took it a couple of times but there was one feature I really hated. At least the last time I tried it, you were required to enter your destination (on Uber you don’t have to do that) and drivers have the option of rejecting your ride, but more importantly the app shows you the rejections! I hated that experience because it was a short fare and I was rejected many times before someone agreed to the fare. I’ve asked Uber drivers about it and they say that with Uber it’s so competitive that if you see a fare you have to jump on it immediately to get it. Bottom line for me is that Uber has created a service on which I depend, to which I pay money and for which I am highly appreciative. I can’t speak statistically about jobs gained or lost but I can say that I employ people for a service I never paid for before: taking me out to dinner. Next up – what I think about self-driving cars.